On a sunny, September morning, there was a vacant lot in the Childs Park neighborhood of St. Petersburg, Florida. To the amazement of neighbors and community members, a brand new home sat on the lot before afternoon was over. This is the second home placed in the Child’s Park neighborhood – part of a larger community redevelopment effort that Tampa Bay Community Development Corporation is participating in. These modular three-bedroom, two-bathroom, 1,400 sq. ft. homes, built by Palm Harbor and were built to match the aesthetic, and meet the same local building codes as the neighboring homes. As a designated community redevelopment area, Child’s Park and the surrounding neighborhoods are giving residents the opportunity to build more value into their existing homes, and providing an avenue for homeownership for residents and families displaced from these communities due to escalating home prices. With this partnership, Tampa Bay CDC is better able to meet the demand for infill housing at a faster pace than with scattered home sites. The homes placed through this partnership are highly energy-efficient (savings buyers thousands in utility costs) and are more affordable compared to homes built on-site. The process of placing a factory-built home is relatively quick. For both homes placed so far, the whole process only took a few hours. The individual sections arrived from Palm Harbor’s manufacturing facility in Plant City, Florida, in the morning, and were craned into place. Specially trained crews aligned the marriage wall (sealing the two sections together) and the initial set was complete by mid-afternoon. 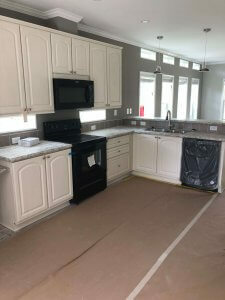 As these are modular homes, they are built to Florida’s residential building code. These codes include specific details including: nine-foot ceilings, cement board siding, metal roofs and a porch that will give the owners a chance to chat with their new neighbors. As neighbors and passersby watched the homes arrive and be placed, the general consensus was both amazement and excitement. Many, if not most, had never seen or even heard of a factory-built home. “That’s crazy, right? You don’t see things like that every day!” said one resident of Child’s Park. Tampa Bay CDC is also managing the housing counseling and homebuyer education for prospective buyers. This ensures that the new homeowners are better equipped for successful homeownership. 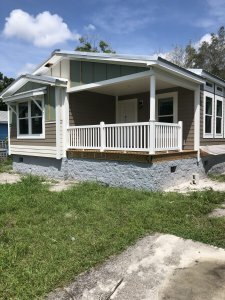 Over the next six to eight months, Tampa Bay CDC and Palm Harbor Homes will be placing more modular homes, increasing affordable housing opportunities in the area. Homes and projects like this one are the start of the new American Dream for many people who never thought they could afford a new home for themselves and their families.